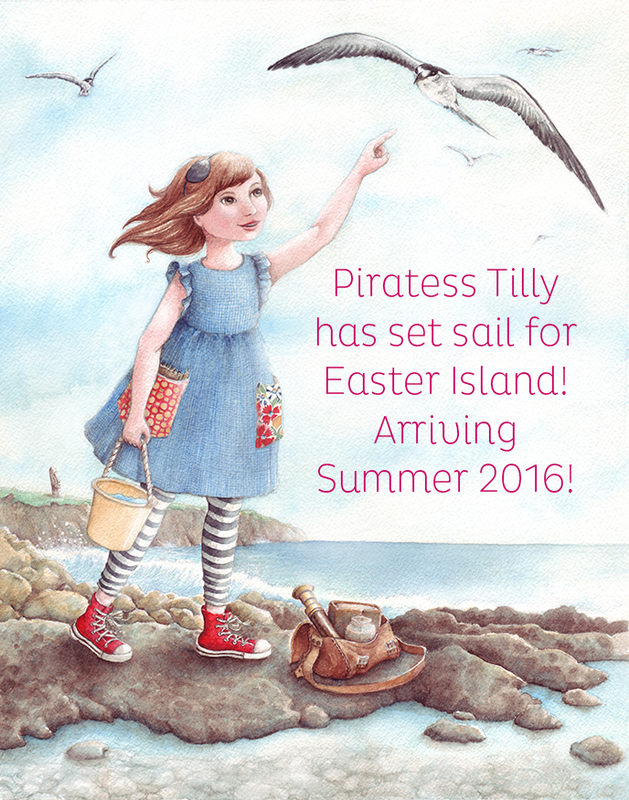 I am thrilled to share some updates for my fine art and my children’s picture book, The Adventures of Piratess Tilly. Let’s start with my fine art. Two of my collagraphs are now on exhibit at The Walsingham Gallery, an award-winning art gallery in Newburyport, MA! I am so honored to be listed as one of their “Emerging Artists!” I had the artwork framed by a wonderful local framer, whose wife happens to be a fantastic artist as well. I highly recommend Connor Summers Gallery! Here are some photos of the work while I was choosing frames and then when they were finished and in plastic wrap. The Adventures of Piratess Tilly is written in haiku and illustrated in watercolors. 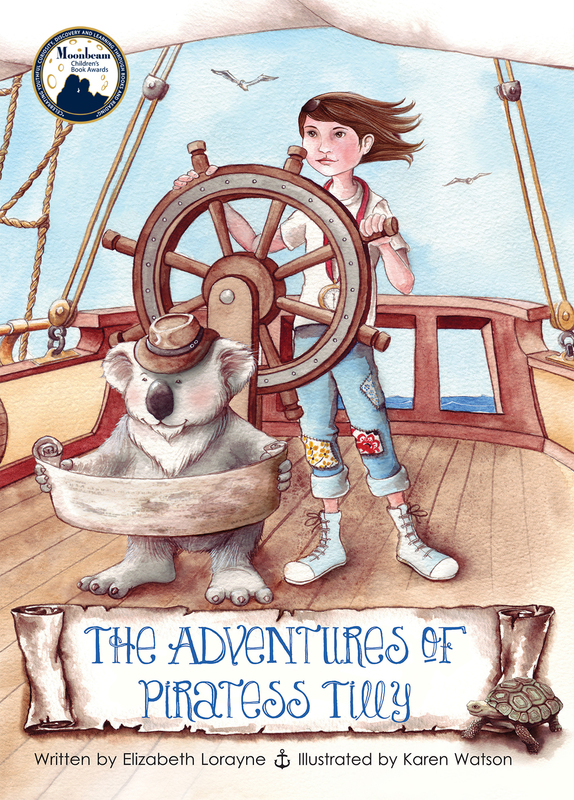 You are invited to come adventuring with Piratess Tilly, her rescued best friend, a koala named Yuki, and her band of international orphaned brothers. As budding naturalists, they are all too eager for their expedition to the Galápagos Islands! While documenting flora and fauna, they spot baby giant tortoises being kidnapped . . . by pirates! How do Tilly, Yuki and the brothers save the tortoises? Just last week we received our first children’s picture book award! 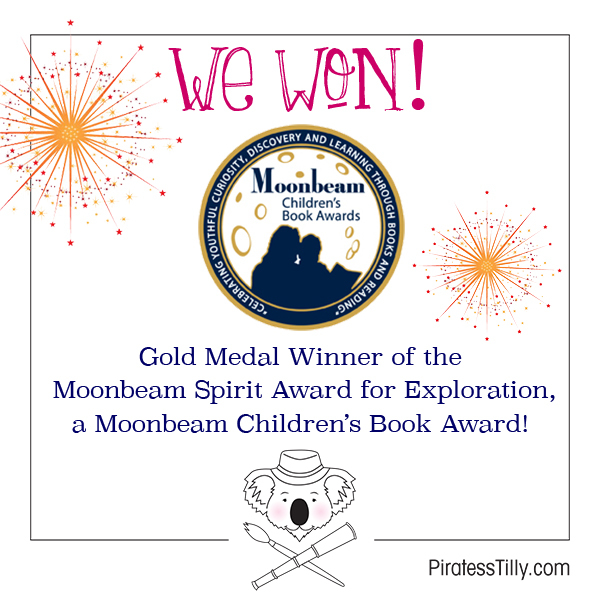 We won a gold medal for the Moonbeam Spirit Award in Exploration, a Moonbeam Children’s Book Award! This is such an honor and we are so excited. I recently joined the Independent Publishers of New England and through their publishing conference met one of the co-owners of Foreword Reviews. The Adventures of Piratess Tilly is now being represented by Foreword Reviews at the Frankfurt Book Fair this week! I am incredibly excited for this exposure. I am also pleased to share that after a successful donation of books, Piratess Tilly is now available for purchase through the Galápagos Conservancy, where all of the proceeds go to their many conservation programs! And for the finale of this whirlwind update~ I have finished writing the second book and Karen Watson is beginning the artwork. This second story takes place on Easter Island and is due out in the summer of 2016! My apologies for the issues around indenting. Not sure why the post isn’t allowing me to properly space!